It seems that the Axis deer herd my parents texted me about is here to stay as I’ve been getting nearly daily updates from the home front that the herd is seen every morning when they head out to work. Obviously, this is not helping alleviate the hunting itch. That’s why hunting buddies exist. So I texted my pal Will who lives down in Corpus Christi. Will and I grew up together, he’s the guy that introduced me to hunting, and has been present for basically every big hunting moment of my life. So I shot him a message to let him know that the Axis were back in force . . . He responded almost immediately to subtly ask if he was going to get an invite this fall (he is). But then he threw me a curve and asked if I wanted to go hunt ducks this season. While I’m a pretty big fan of Duck Dynasty, I’ve never been much of a bird hunter, a situation I’m already planning to remedy this year with some dove hunting at the ranch. Which is hilarious in retrospect. I mean, yeah, we’re TTAG, and we’re known for our hard-hitting coverage and all, but it still blows my mind that I can call up Benelli and ask for a $1800 gun, simple as that. But you know, nothing ventured, nothing gained. So I sent Tom an email explaining that I’d committed to a duck hunt and didn’t have a duck gun or the faintest clue how to get a duck from sky to the table. He responded almost immediately to let me know that I had the full backing of Benelli and that they’d be happy to send me a loaner for the newly created “First Time Duck Hunter” series I’d just made up. He offered me my choice of the following; SuperBlack Eagle II, Super Vinci, Franchi ITENSITY, or Stoeger 3500. I’d had the opportunity to shoot a Super Black Eagle during a bird hunt nearly ten years ago in Mexico, and I was pleased with how easy it shot, how reliable it proved to be, and the general level of fit and finish. I’d also heard from one of the local helicopter hog hunting pilots that the State of Texas only uses Super Black Eagles since they’re the only shotgun that can hold up to the thousands of rounds of 3-1/2″ #00 buck sent downrange during their culls of the wild hog population. With that in mind, I asked nicely for a Super Black Eagle II, but asked if our readership might call me an elitist for picking the very expensive Benelli. Tom’s response was swift and is reprinted below, unedited. Will someone call you an elitist? Probably. Someone else will probably call you not legit if you hunt with an inexpensive gun. The Benelli SBE II sets the standard in duck blinds, standing timber, and duck boats across the world. It just can’t be argued otherwise. It is a waterfowl killing machine. 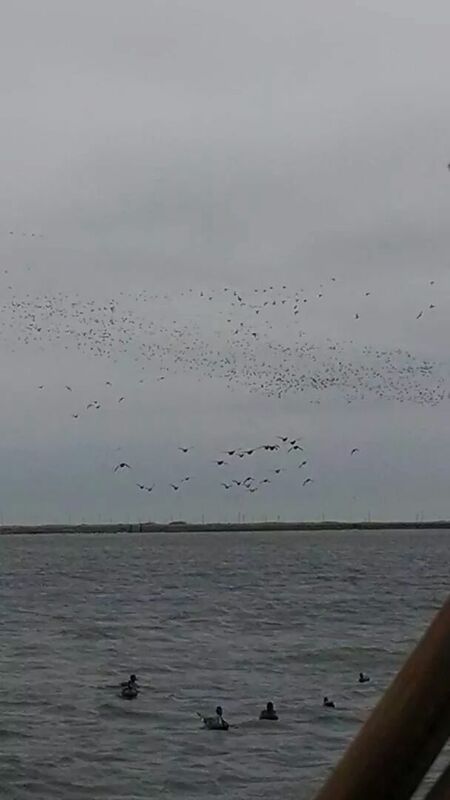 If you’re hunting in brackish water in South Texas you’ll see plenty SBE II’s. Duck hunters are incredibly dedicated and passionate about their hunting, their dogs, and their guns. So it is not uncommon for a duck hunter to save for years to buy a Benelli SBE II. If you’re a motorcycle guy you may forego the new flat screen for some new chrome or straight pipes to make your bike the best. It’s all about someone’s priorities and there’s not a lot duck hunters put ahead of their gear. Shooting an SBE II doesn’t make you an elitist, just makes you someone who wants unrelenting reliability, superior performance, and the kind of gun you can use as a canoe paddle then rinse off and shoot all day. Frankly you’ll find the same thing in the SuperVinci in a more modern design (it’s what I shoot). Sorry! We have a lot of pride in our product! I admire the hell out of that sort of response. I love when the employees of a company are adamant about how great their particular “thing” is. Especially when it comes across as so confident that it gets presented as fact. I’m super excited about the opportunity to go bust some ducks in December with my hunting buddy Will and a Super Black Eagle II. Will’s excited too as evidenced by the nearly constant stream of pictures I’ve been getting from him of last season’s ducks blacking out the sky. Assuming the shipping gods smile upon me, I may actually get to give that Benelli a try in a few weeks when I go dove hunting at the ranch. As always, I’ll write about everything that comes up from gear to guns to calls in preparation as well as a full review of the duck hunting in South Texas. And as you’ve come to expect, we’re gonna beat the hell out of that Benelli and give you a full review when the dust settles. Strap in folks, we’re going bird hunting. Hah…just kidding. I got to shoot a Benelli SBE once. S-W-E-E-T. Color me jealous more than anything else. I’m very much looking forward to reading all that you have to say once you get your hands on it! I have a SBE I that I’ve had forever and year after year I’m the only one in the duck blind with no malfunctions. Damn fine gun. Im hoping to upgrade sometime to the SBE II but right now don’t see the point! Good luck my friend. May you be the Jägermeister of the duck blind. I went for the SuperVinci, but as long as you get a 3 1/2 Benelli with a comfortech stock (gotta have the comfortech) you’ll be happy. There’s no gas ports or back boring so you get 100% of the magnum power, unlike the others. Can’t say that it’s really worth the money but it is easily the best and they haven’t gotten cheaper. I’ll never regret buying this gun even if I did pay for the name. SBE is a good choice but I prefer the much softer shooting Maxus, especially with hot 3.5″ loads. To each their own. I’m looking forward to another waterfowl season in Illinois. We had a record year here last year for geese. The only bright spot with the Polar Vortex! Bring it on up to Oregon. I’ll take you Chukar hunting in the deepest canyon in North America. For dinner, well have bacon wrapped Chukar breast glazed in honey butter. What’s a chukar? I gather a bird, but never heard of it. Tyler, no shame in the benelli at all! Dont know about texas, but over to your left in the sportsmans paradise, we have a 14 day season in September for blue wing and green wing teal. It’s a great time to introduce a first timer, helps iron out all the little details (getting used to the blind, calls, bird identification, walking in waders, walking in waders in the mud, etc.) without the consequences of the fall cold. Plus it’s hard to beat the excitement that a group of teal can cause when screaming through the decoys 6″ off the water! Good luck to you brother! Tough to beat a Benelli. I opted for the M2 (actually 2 of them), because I’ve never shot 3.5s, and never will. The abuse they take is nothing short of amazing. Duck. Is there a place on the web where you can be trained to make duck taste better than a boot filled with muddy pond water? Not a recipe… Training. Serious training. It’s all in the pre cooking prep. Brine em’, brine em’, brine em’. The biggest mistake people make is cooking them too long. Just marinate about 16hrs in Italian dressing and grill ’em over charcoal and wood chips till medium rare. If you filet off the meat or skin them they won’t be greasy. Easy. 2) Fillet out the breast. 3) Put the breast in a ziplock bag with about half a cup of salt and shake it around.
. … a) Should I let it sit for a few days in the fridge? 4) Then take out the breast and put it in a different ziplock filled with Italian dressing, marinating for 16 hours. Muddy boot flavor gone, smiles all around the table!… Right? Yes! Medium rare, can’t miss. Let them sit a day in brine, then dump, add water, and repeat for 2 more days. No harm in wanting the best tool for the job! Happy hunting y’all, fall is coming! Nice write up Tyler. I am going for dove for my first time this year. I hope to hunt quail also. I bought a Benelli Nova 12 gauge. Got a smoking deal, brand new. I know it is nothing compared to duck hunting, but I am really excited. Labor Day is a paid holiday for me also, so getting paid to hunt. Can not beat that for anything. Good hunting everyone! I like dove hunting about as well as anything. And if I get a good close in shot with my 3.5 Benelli, they come down skinned gutted and cooked. I eat them right there in the field. I think you might be a “stretcher of the truth”, I don’t believe the part about them being cooked! They’ll usually be a little less than medium rare. Tyler: Remember to channel Tom Knapp while shooting the SBE! About the only way I like duck is Jerked…But i think ill try that Italian dressing thing this year. My first duck hunting trip was the weekend before Thanksgiving 2012 just outside of Garwood TX. Short story – It was a great time. I brought home one Spoon Billed Duck and one Speckle Belly Goose. They are both went into the freezer. Goose was saved and eaten as The Christmas Goose and the duck was eaten in the Spring. Full story – Dang it is a long drive from Nashville to Houston. The Hunters (me, John, Henry and Max the Dog) got up early Saturday morning to start off on the ducks. We had not been near the pond two minutes when Max took off into the water and caught a duck. It was pretty crazy to see her bring one back to us. As for me, I had just bought a brand new Benelli Nova 12 gauge for the trip and had not had time to test it out even once. Since John was controlling Max that morning he did not bring a shotgun. John said ‘Let me see your shotgun.’ I passed it off to him and soon a duck came flying by. John took aim, fired and missed that duck. That was the first shot out of my brand new gun and he missed! I was very sad. He gave it back so I loaded a new shell and waited for another duck to come flying by. A little while later another one came by and John said ‘Get him’. I took aim and blasted him in the wing and side. My first shot on the shotgun and my first shot ever at a duck and I nailed him! I was on cloud nine after that. Rest of the day was a bust since the weather was so nice. No wind, in the 50s and not a cloud in the sky. We could hear and see thousands of geese in the neighboring plot of land but once they took off they flew out of range. That nice weather was the antithesis of duck/goose weather. Sunday the weather was much of the same but John and I both shot Speckle Belly geese. Monday morning Henry bagged a Canadian Snow Goose. Since then I have used that Benelli Nova to bust up hundreds of clay pigeons and a few dozen doves. Dove season is about to start here in TN and I cannot wait. I do not have the funds to drop on a SBE II but the Nova is worth every penny. I’m posting this on the main page. Benelli makes awesome semi- autos. My buddy loves his SBE, and I love my Benelli for sporting clays. I been waterfowl hunting for 15 yrs. bought my first SBE II 2 yrs ago and fell in love with it. Will never shot anything else. The sad part this last weekend during Indianas opener. I was going after a wounded goose and when my dog jumped out of the boat gun went in. 8ft deep. Will start saving for another one.